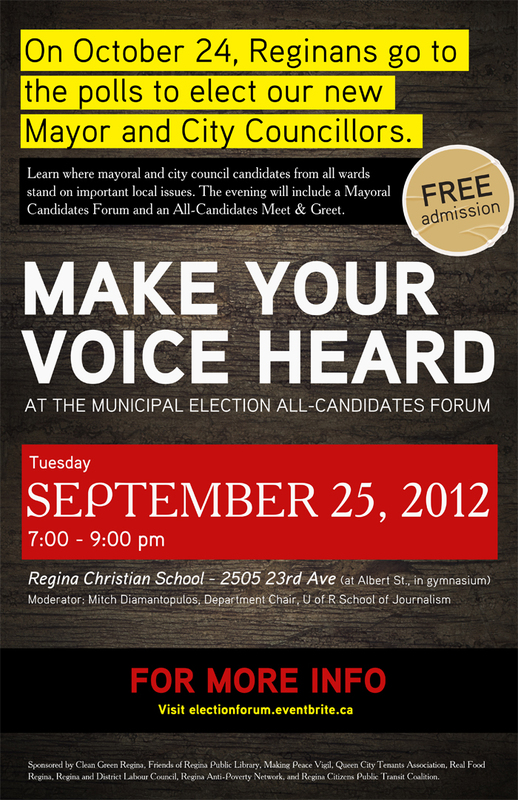 Moderator: Mitch Diamantopoulos, Department Chair, University of Regina School of JournalismCome learn where mayoral and city council candidates from all wards stand on important local issues – affordable housing, food security, public transit, and more.7:00 – 8:00 pm: Mayoral candidate forum. Bring written questions for Regina’s potential mayors to answer! 8:00 – 9:00 pm: All-candidates meet and greet. Meet the mayoral candidates and city council candidates from all city wards. Sponsored by Clean Green Regina, Friends of Regina Public Library, Making Peace Vigil, Queen City Tenants Association, Real Food Regina, Real Renewal, Regina Anti-Poverty Network, Regina and District Labour Council, and Regina Citizens Public Transit Coalition. This entry was posted in Uncategorized and tagged All Candidates Forum, City Councillor, City of Regina, Civic, Election, Friends of the Regina Public Library, Make Your Voice Heard, Mayor, public consultation, public private partnership, regina, Regina Public Library, RPL. Bookmark the permalink. The Leader-Post will be live blogging the Make Your Voice Heard All-Candidates Forum, which is taking place at the Regina Christian School at 7 p.m. on Sept. 25. Regina’s mayoral candidates will be discussing a number of local issues at the event, which is open to the public.